4. Alfred Edward Mathews (1831-1874). South Park. Tinted lithograph, Plate 15. Mathews, A.E. Pencil Sketches of Colorado. New York: The Author, 1866. St. Louis Mercantile Library at the University of Missouri - St. Louis. 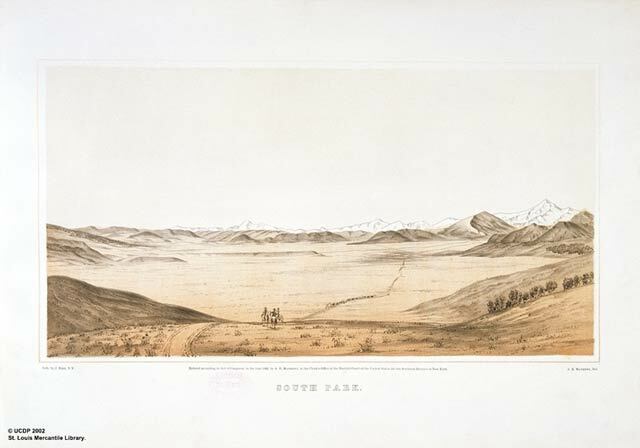 "The beauty of the South Park is doubly impressed on the mind by the sudden and unexpected manner in which the whole scene bursts upon the view [when approaching the Park from the North]. While ascending a slight rise the traveller is looking directly in front, thinking that he sees the mountain tops on the opposite side of the Park, when the road turns to the right around a hill, and the whole scene is unexpectedly spread out before him."